Editor’s Note: This guest post is written by Nir Eyal, a founder of two startups and an advisor to several Bay Area incubators. Nir blogs about technology and behavior design at nirandfar.com. Face it; you’re hooked. It’s your uncontrollable urge to check for email notifications on your phone. It’s your compulsion to visit Facebook or Twitter for just a few minutes, but somehow find yourself still scrolling after an hour. It’s the fact that if I recommended a book to purchase, your mind would flash “Amazon” like a gaudy neon sign. If habits are defined as repeated and automatic behaviors, then technology has wired your brain so you behave exactly the way it wants you to. In an online world of ever-increasing distractions, habits matter. In fact, the economic value of web businesses increasingly depends on the strength of the habitual behavior of their users. These habits ultimately will be a deciding factor in what separates startup winners and losers. Ever since the creation of the first online media companies at the dawn of Web 1.0, businesses have made money from their users’ behaviors. Early online media enterprises like AOL and Yahoo! sold their users’ attention to advertisers in the form of ad impressions. However, Web 1.0 companies measured themselves on pages viewed and CPM rates, rather than the strength of their user habits. As millions of dial-up customers came online for the first time, these companies were lulled into complacency as their user numbers grew. Such self-assurance left them vulnerable to attack from social media companies, which plundered their user base as the web evolved. Facebook, YouTube and Twitter, armed with an arsenal of behavioral engineering weaponry including hot triggers, variable rewards, and social proof eventually dominated the Social Web. Upon reaching critical mass, these companies began selling user behavior as well. But unlike Web 1.0 companies, social media proved so valuable and habit-forming, users begrudgingly allowed these businesses to layer personal and demographic information onto their ad units, resulting in increased revenue and profitability. Today, at the dawn of the Curated Web, companies must build habit creation into their products and business models. Not only are users inundated by distractions, but acquiring users is also harder than ever before. Finding new users through paid advertising rarely provides a positive return on investment. And while viral mechanics are still employed, users are becoming increasingly intolerant of applications spamming their contact lists for the purpose of inviting new users to join a service. Viral growth is also under attack as platforms like Facebook, Apple, and Android respond to customer complaints and quickly shut down such tactics. Relying too heavily on viral growth is also bad for business. Silicon Valley is strewn with the stories of “leaky bucket” companies – businesses that grew quickly, annoyed lots of people, and died. While some of these companies were pure spam, others offered value to users but failed to form habits. 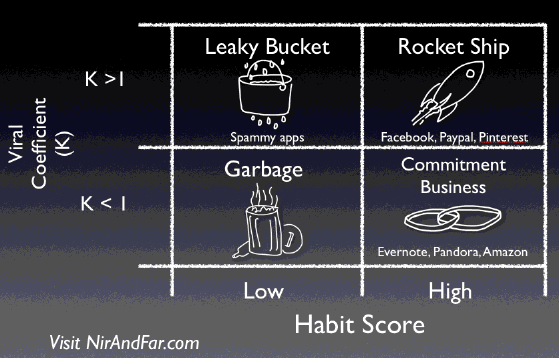 Of course, attaching user habits to a viral growth engine is ideal, the embodiment of the rare “rocket ship” business. However, it is important to note that companies, which successfully create user habits, even without viral growth, can build huge enterprises. I call these companies “commitment businesses” because users become increasingly tied to the service the more they use it. Evernote’s famous smile graph provides the clearest visualization of how a commitment business establishes a user habit. Though originally rebuffed by investors who could not see past the company’s slow growth, Evernote succeeded by betting on habit formation and patiently waited for its users to prove the company right. Other successful slow-growth commitment businesses have similar stories, including Pandora and Amazon. Increasingly, companies will become experts at designing user habits. Curated Web companies already rely on these methods. This new breed of company, defined by the ability to help users find only the content they care about, includes such white-hot companies as Pinterest and Tumblr. These companies have habit formation embedded in their DNA. This is because data collection is at the heart of any Curated Web business and to succeed, they must predict what users will think is most personally relevant. Curated Web companies can only improve if users tell their systems what they want to see more of. If users use the service sparingly, it is less valuable than if they use it habitually. The more the user engages with a Curated Web company, the more data the company has to tailor and improve the user’s experience. This self-improving feedback loop has the potential to be more useful – and more addictive — than anything we’ve seen before.